Electric vehicle owners can plug in their cars and forget about them, knowing they'll get the cheapest electricity available and won't crash the grid - using a new technology called the Smart Charger Controller. 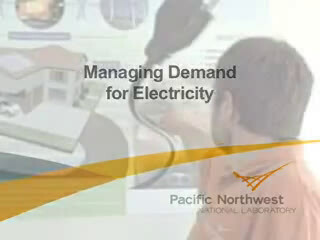 Developed at the Department of Energy's Pacific Northwest National Laboratory, the controller automatically recharges electric vehicles during times of least cost to the consumer and lower demand for power. Widespread use of these devices could help advance a smart power grid. Electric vehicles will ultimately reduce the nation's dependency on oil. While the new vehicles will serve as an additional source of power demand, they also could contribute to an even "smarter" grid if equipped with controller technology. 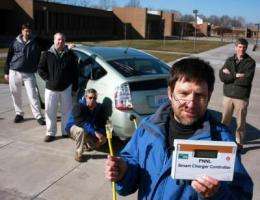 "If a million owners plug in their vehicles to recharge after work, it could cause a major strain on the grid," said PNNL engineer Michael Kintner-Meyer. "The Smart Charger Controller could prevent those peaks in demand from plug-in vehicles and enable our existing grid to be used more evenly." That efficiency translates to a more stable grid and cheaper power. "Using the device could save up to $150 a year for electric vehicle owners who pay based on when they charge their vehicle," Kintner-Meyer said. Electric vehicles will become widely available starting in 2011. The current Administration supports a goal of one million electric vehicles on the road by 2015. A previous PNNL study showed that America's existing power grid could meet the needs of about 70 percent of all U.S. light-duty vehicles if battery charging was managed to avoid new peaks in electricity demand. The Smart Charger Controller does just that. Owners program the controller to charge at a specific time of day or night or at a set price point. The controller uses a low-range wireless technology to communicate with the power grid and determine the best and cheapest time to recharge vehicles. By charging vehicles during off-peak times, the controller saves consumers money. Previous PNNL studies with household appliances show that "smart" technologies also save the grid from brown-outs with little impact to the consumer. Grid Friendly™ technology inside the Smart Charger Controller senses stress conditions on the grid. When the grid says more power is needed, the controller can temporarily stop charging the vehicle until the stress subsides. This instant reduction in charging load, multiplied on a large scale with many vehicles, could serve as a shock absorber for the grid. The technology would relieve load instantly and give grid operators time to bring new power generation sources on line to stabilize the grid - a process that usually takes several minutes. With more electric vehicles on the horizon, road-ready, smart charging technology can be used now, according to Kintner-Meyer. Advancing technologies like the Smart Charger Controller today will enable the new generation of electric vehicles to be "smarter" once they're available commercially, he noted. Study: Are plug-ins the next wave of hybrid vehicles? At least someone is trying. I, for one, can't wait to feel the raw power that only an electric motor can produce. Yeah, but for me to ever own one they would need to make it not only detect the price of the fuel and the time, but weigh that against the amount of charge on my vehicle. I mean, I don't care what time it is, I'm going to want to be able to go at least 30 miles in case of an emergency.